Female Cyclists Start Petition To Join Tour De France In 2014 : The Two-Way Citing the inclusion of women at the world's top marathons, the petition's authors say, "After a century, it is about time women are allowed to race the Tour de France, too." 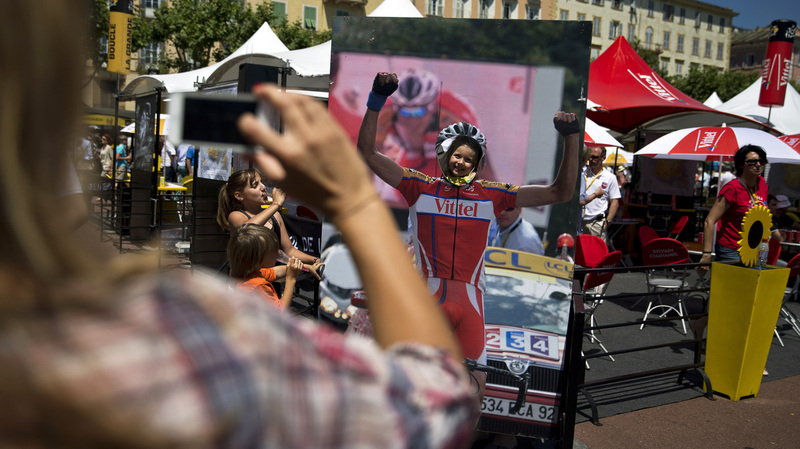 A woman takes a picture of a little girl posing in a cyclist cutout at the 2013 Tour de France. A new petition calls for including women in the epic race. Calling road cycling "one of the worst offenders" in gender inequity, four elite female athletes have created a petition to ask the sport's hallmark event, the Tour de France, to include women next year. Citing the inclusion of women at the world's top marathons, the petition's authors say, "After a century, it is about time women are allowed to race the Tour de France, too." The Change.org petition was begun by Kathryn Bertine, an American cyclist and journalist, along with some of the biggest names in cycling: Olympic and world champion Marianne Vos of the Netherlands and world champion Emma Pooley of Britain, as well as British triathlete Chrissie Wellington, a four-time World Ironman Champion. "The women's road race at the London Olympics was a showcase for how impressive, exciting, and entertaining women's cycling can be," the petition states, recalling last summer's 87-mile race in which Vos sprinted to victory in a tight finish. The petition is addressed to Christian Prudhomme, the director of the Tour that's put on by the Amaury Sport Organization. But as the SportSister website notes, Prudhomme and ASO may not be able to enact change all on their own. That's because the sport's governing body, the Union Cycliste Internationale, "currently has rules in place that limit the distance women can ride in a single stage to much less than men," SportSister reports. "This means a female Tour alongside the current event would not be possible unless they started or finished their stages in different places." A look at the UCI's rules posted on its website confirms the limits for one-day events, which are either complete races or stages of a longer competition. Cyclists in the Elite Women category are allowed to ride a maximum of 140 kilometers (87 miles) in a day, compared to maximum distances of from 240 to 280 km (150 miles to 174 miles) for the top Elite Men's races. The Tour de France is part of the UCI World Tour series, and maximum distances are set by a smaller council. Speaking with BBC Radio 4, Pooley notes that a female version of the Tour de France took place in the 1980s, which she recalls as being "two weeks long, really tough, with proper mountain stages." But organizers of the Tour de France Feminin lacked strong sponsorship, and they were eventually sued for copyright infringement by the men's race, Pooley says. Citing the parallel events for women and men in the Olympics, she adds that the public is interested in seeing female cyclists compete, calling the current situation a missed opportunity. After the surge of interest during last summer's London Games, she says, "A lot of people said to me, 'Well, where can we see watch more of your racing?' And I said, 'Well, you can't — because it's not on television." As for concerns that adding women would overcomplicate the already challenging logistics of the race, Pooley says, "To be honest, the Tour de France is such a huge logistical challenge anyway, that adding 50 or 70 women wouldn't make a huge difference." And she notes that the spectators who line the roads for hours to get a glimpse of cyclists would get more entertainment, giving them two races to watch. The petition cites other cycling races, such as the Tour of Flanders and Flèche Wallonne, that have incorporated female riders into their events. "In the late 1960s people assumed that women couldn't run the marathon. 30 years on we can look back and see how erroneous this was. Hopefully 30 years from now, we will see 2014 as the year that opened people's eyes to true equality in the sport of cycling." As of noon ET on Friday, more than 3,000 people had signed the petition. A top-rated comment supporting the cause came from Mélodie Dubreuil of Lyon, France, who wrote that little girls "should be able to have the dream of winning the Tour de France and to transform it into reality too."